Magnetic, Counter or Table Top display stands, for use in your reception, conference rooms, hotels or simply to display your latest promotional material. The stands have a stainless steel top, magnetic screen to hold posters, price lists, POS. Easy to change, with scratch resistant front cover. Landscape or Portrait. Please click through to next page to select size, colour and orientation. 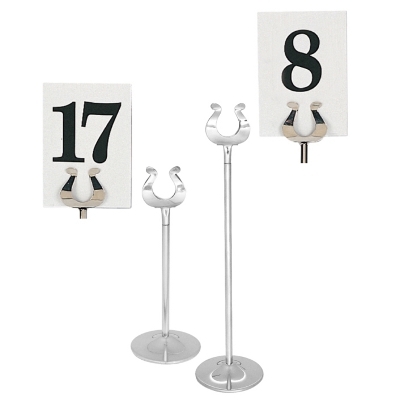 Pack of plastic Table Stand Numbers to be used with the stainless table stand. Stainless steel Table Stands for restaurants/cafes. Available in different heights: 4"at £6.59 each, 8" at £8.69 each, 10" at £10.89 each and 12" at £11.99 each.